In love with Formula 1: Canadian GP: Ferrari´s tyre strategy costly for Sebastian! Canadian GP: Ferrari´s tyre strategy costly for Sebastian! Surprisingly it wasn´t raining, when the race was about to get underway. It was cold and windy, but luckily no rain. What a spectacular start Sebastian took from P3! He stormed to the lead making it past both Mercedes drivers right away! The Mercedes teammates were alongside each other going into Turn 1, and their front wheels touched, which made Rosberg go wide and lose many positions. The German rejoined the track in disappointing P10. Hamilton was second and Verstappen third, after passing his teammate Ricciardo at the start. Kimi was fifth and the other Finn Bottas in P6. By lap 10 Sebastian and Hamilton were running away from their rivals, as Verstappen was already 8 seconds down on the race leader Sebastian. Ricciardo, on the other hand, was right at his teammate´s tail. It seemed, that Ricciardo was faster than Verstappen, and soon Max got the expected message on the team radio: "Don´t hold up your teammate." I was almost certain, that Max wasn´t going to obey the team order. And I was right; Max immediately started to set more competitive and faster lap times. On lap 11 McLaren´s Button suffered a sudden loss of power, and the Briton´s race was over. Button´s retirement caused virtual safety car to be deployed. Both Ferrari drivers were called into the pits, and they both opted for the red-marked supersoft compound. I was quite surprised about the tyre choice, as there was no way the Ferrari duo could drive till the very end on those tyres! Sebastian rejoined the track in P4, but Kimi instead dropped down to P14 due to his early pit stop. After the pit stop Sebastian was significantly quicker than the Red Bulls ahead of him, and Ricciardo was Sebastian´s first target. And finally there was nothing the Australian could do to prevent the hungry Ferrari ace from overtaking him. Only a lap later Sebastian made a stunning overtaking move on Verstappen, and Sebastian jumped already second. At this point it seemed, that Sebastian was definitely going to fight for victory at Montreal. Verstappen pitted on lap 20, and the Dutchman opted for the yellow-marked soft tyres, which was the hardest compound used in Montreal. Teammate Ricciardo pitted a couple of laps later -also for a fresh set of soft tyres. Soft tyres were also Rosberg´s choice, as the German pitted a lap after Ricciardo. 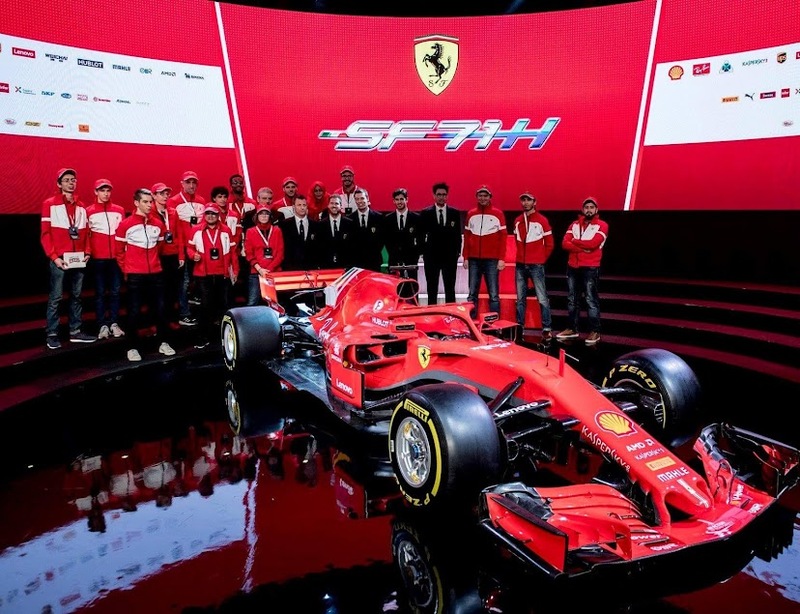 Now I started to be pretty worried about Ferrari´s tyre strategy: Had the Italian-based team made the right call when opting for the supersofts? Bottas in his Williams pitted on lap 24 and race leader Hamilton on lap 25 -both for a fresh set of soft tyres. Ferrari was the only team to choose the supersoft tyres for the second stint. And it seemed, that the Ferrari drivers were the only ones on a two-stop strategy! On lap 27 Sebastian was leading the race; Hamilton was 13 seconds down on the Ferrari pilot. Verstappen was third, Kimi was 4th, Ricciardo 5th, Bottas 6th and Rosberg 7th. On lap 34 Kimi pitted for the second time -this time for a fresh set of soft tyres. Due to his pit stop Kimi dropped down to P8. Sebastian pitted three laps later, and his tyre choice was similar to Kimi´s. Sebastian rejoined the track in second place, but had many cars ahead of him to be lapped. Bottas managed to get past Red Bull´s Ricciardo, and the Finn jumped fourth. Ricciardo was struggling with his race pace; also Rosberg managed to overtake the Australian a few laps later. Ricciardo was called into the pits, this time for another fresh set of soft tyres. Verstappen pitted on lap 47 -this time for a fresh set of ultrasoft tyres, and the Dutch Red Bull pilot rejoined the track in P5 -right ahead of Kimi. At this point Sebastian was consistently closing the gap to Hamilton in the lead. Rosberg on the other hand, was facing difficulties, as there were several warning lights on his steering wheel. He was also told on the team radio, that he was having a slow puncture, and the German had no choice but to pit on lap 52. On the fresh tyres Rosberg was flying; inevitably the German made his way first past Ricciardo and then past Kimi. With 10 laps to go Hamilton was leading the race, Sebastian was second, and Bottas was convincingly third. Verstappen was fourth, Rosberg fifth and Kimi 6th. Sebastian´s chase for Hamilton wasn´t entirely problem-free, as the German went wide at the chicane more than once. One time there were two seagulls sitting in the middle of the chicane, which caused Sebastian a lock-up! In the closing laps Rosberg had also chased down Verstappen and put lots of pressure on the Dutch teenager. A couple of times Rosberg even made it alongside Verstappen, but Max defended his fourth position in a brilliant and genius way; he was absolutely persistent not to let Rosberg through! On the second last lap Rosberg ended up spinning when trying to get past Max; however, he still managed to keep his fifth place. This battle showed once again, that there´s something extraordinary about this young Red Bull driver. Not every driver has the courage and attitude to drive like this young man does! So fifth Montreal win for Hamilton. I had been hoping, that Sebastian could have challenged the Briton for victory for real. It was close, but still so far away! Williams has been struggling with their performance this season, so Bottas was absolutely delighted about making it on the podium. Verstappen made an awesome job by finishing 4th, and Rosberg had to settle for P5. Kimi was also struggling with his pace; to me it seemed as if Kimi had been driving a whole different car compared to his teammate! Yesterday´s result means, that Hamilton is now only 9 points down on his teammate in the drivers´ championship standings. Sebastian has now jumped third, but he´s already 38 points down on Hamilton. Luckily racing is back on already this week, as Formula 1 moves to a brand new venue of Baku street circuit in Azerbaijan! Can´t wait! Europe GP: Rosberg triumphed to victory!